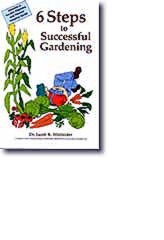 Using the Mittleider Method taught in the Six Steps book will help you grow 5 to 10 times more healthy delicious vegetables and fruits than a traditional garden in the same space. Follow the simple steps in this book and you can save many hundreds of dollars a year on your food bills. Probably the biggest reason you garden is to improve your health by eating fresh, naturally grown vegetables & fruit. The Mittleider Method consistently produces the healthiest and most tasty produce possible. This book is so fun to read even children enjoy and learn from it, and every step of the way is graphically illustrated for instant understanding. 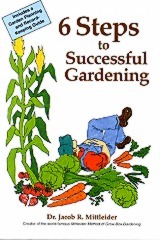 All the basic gardening you need to grow a great garden – no matter what your soil and climate are like – is contained in less than 60 pages! This is all while using NO pesticides or herbicides! You’ll also save additional money because this gardening method uses less than half the water of a traditional garden. Learn the simple secrets of the Mittleider method of gardening that’s been taught and loved by millions of families for over 40 years around the world. Download Chapter 1: Soil and Soil-Bed Preparation (PDF, 472 KB) and learn what makes good soil and different approaches to making your own soil-beds.